Man-made CFCs are the main cause of stratospheric ozone depletion. CFCs have a lifetime of about 20 to 100 years, and consequently one free chlorine atom from a CFC molecule can do a lot of damage, destroying ozone molecules for a long time. Although emissions of CFCs around the developed world have largely ceased due to international control agreements, the damage to the stratospheric ozone layer will continue for a number of years to come. Chlorofluorocarbons or CFCs (also known as freon) are non-toxic, non-flammable and non-carcinogenic. They contain fluorine atoms, carbon atoms and chlorine atoms. The 5 main CFCs include CFC-11 (trichlorofluoromethane – CFCl), CFC-12 (dichloro-difluoromethane – CFCl), CFC-113 (trichloro-trifluoroethane – CCl), CFC-114 (dichloro-tetrfluoroethane – CCl), and CFC-115 (chloropentafluoroethane – CCl). In the past, CFCs have been widely used as coolants in refrigeration and air conditioners, as solvents in cleaners, particularly for electronic circuit boards, as a blowing agents in the production of foam (e.g. fire extinguishers), and as propellants in aerosols. Indeed, much of the modern lifestyle of the mid-20th century had been made possible by the use of CFCs. 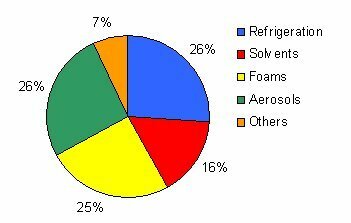 The pie chart below shows the uses of CFCs in various products before the 1987 Montreal Protocol, which required countries to phase out their usage to protec the ozone layer. No new CFCs have been produced since 1995 in developed nations. Total usage of CFCs has also fallen dramatically, particularly by aerosols. The only aerosols using CFCs in the developed world are asthma inhalers and these too are being phased out. Aerosol propellants now use only 4.9% of total use of CFC-11 and CFC-12 in the world today. How do CFCs Destroy the Ozone Layer? Emissions of CFCs to date have accounted for roughly 80% of total stratospheric depletion. Whilst chlorine is a natural threat to ozone, CFCs which contain chlorine are a man-made problem. Although CFC molecules are several times heavier than air, winds mix the atmosphere to altitudes far above the top of the stratosphere much faster than molecules can settle according to their weight. CFCs are insoluble in water and relatively unreactive in the lower atmosphere but are quickly mixed and reach the stratosphere regardless of their weight. When UV radiation hits a CFC molecule it causes one chlorine atom to break away. The chlorine atom then hits an ozone molecule consisting of three oxygen atoms and takes one of the oxygen molecules, destroying the ozone molecule and turning it into oxygen. When an oxygen molecule hits the molecule of chlorine monoxide, the two oxygen atoms join and form an oxygen molecule. When this happens, the chlorine atom is free and can continue to destroy ozone. Naturally occurring chlorine has the same effect in the ozone layer, but has a shorter life span. Read more facts about ozone layer depletion. Since 1995, emissions of new CFCs in the developed world have been completely phased out. As evidence accumulated that man-made CFCs were contributing to stratospheric ozone depletion, scientists urged nations to control the use of CFCs. In 1987, the Montreal Protocol on Substances that Deplete the Ozone Layer was negotiated and signed by 24 countries. The Protocol called for the parties to phase down the use of CFCs, as well as other ozone depleting chemicals such as halons and other man-made halocarbons. Although emissions of CFCs have fallen dramatically as a result of the Montreal Protocol, because each chlorine molecule remains in the atmosphere for such a long time, damage done to stratospheric ozone will persist for many years to come.